Explanation: Many spiral galaxies have bars across their centers. Even our own Milky Way Galaxy is thought to have a modest central bar. Prominently barred spiral galaxy NGC 1672, featured here, was captured in spectacular detail in an image taken by the orbiting Hubble Space Telescope. Visible are dark filamentary dust lanes, young clusters of bright blue stars, red emission nebulas of glowing hydrogen gas, a long bright bar of stars across the center, and a bright active nucleus that likely houses a supermassive black hole. 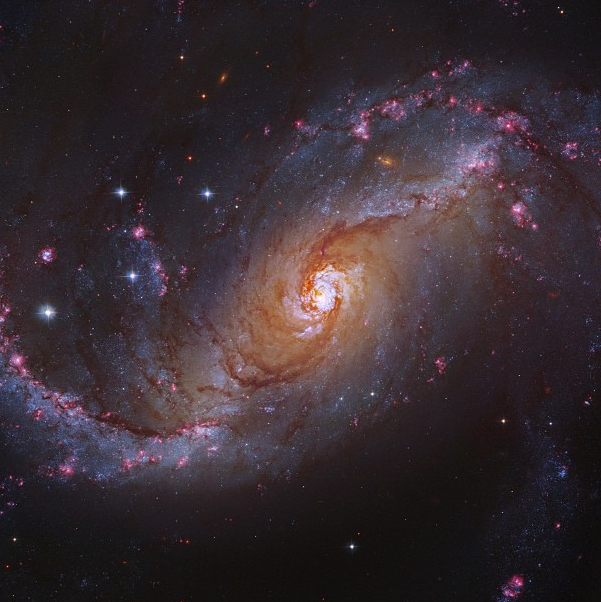 Light takes about 60 million years to reach us from NGC 1672, which spans about 75,000 light years across. NGC 1672, which appears toward the constellation of the Dolphinfish (Dorado), is being studied to find out how a spiral bar contributes to star formation in a galaxy's central regions. If you mean the bar at the end of the universe it's at the OTHER end of the universe. NGC 1672. Photo: NASA/ESA/Robert Gendler. I'm usually very enthusiastic about galaxy pictures, but I find today's APOD sort of "soft" and blurry. It isn't blurry in reality, because it shows off individual stars in the galaxy very well. I suppose the colors are too diluted and non-saturated for me. Another possible problem - if it is a problem - might be that the processing of today's APOD has (probably) brightened intermediate stellar populations close to the bar, thus making the bar itself harder to discern. That is why I prefer Rob Gendler's processing of the NASA/ESA/Hubble data over today's APOD. I guess that's the value of having APOD revisit familiar objects with different processing. Personally, I don't think I've ever seen a Gendler image I cared much for, finding them all garishly oversharpened and oversaturated- painful blues and magentas that look nothing at all to me like natural objects. It's the more natural appearance in terms of intensities and colors that makes me like today's image. I guess that's the value of having APOD revisit familiar objects with different processing. It's the more natural appearance in terms of intensities and colors that makes me like today's image. You said it, Chris. Even I must agree (sort of). No really, I do agree. It's just that I love my Gendler-style galaxy pictures more than you probably love your Domingo Pestana & Raul Villaverde-style ones. Now that I've looked at the APOD on my big computer screen at home, I like the picture a lot better than when I looked at it on my much smaller computer screen at work. Many of the details are stunning. Note, for example, how halfway between the outer left arm and the center there is a star forming site in an inner arm that is virtually "smoking stars", like a chimney is "smoking smoke", or like a popcorn saucepan is popping popcorns. One thing that makes me wonder is the apparent lack of red giant stars. Yes, there are a few "ordinary-looking" red giants to be seen, but very few of them. Compare today's APOD with this 1.26 MB Hubble picture of NGC 4214. (Or check out this page. )The pictures of NGC 1672 and NGC 4214 are not comparable, since different filters were used for them, but please note, nevertheless, how many red giants there are among the blue stars in the Hubble picture of NGC 4214. In NGC 1672, by contrast, there are a few normal-looking red giants and a number of too-bright ones. There are two overly bright ones near 2 o'clock, one of them located just below a small site of star formation. These two apparently stellar objects are small, round, very orange and very bright in the middle, and they don't look much (or at all) like the obvious orange-colored background galaxies that can be seen right through the disk of NGC 1672. But even though these apparently stellar objects are small, they are a lot bigger and brighter than virtually every blue star in NGC 1672. I guess they might be very distant elliptical galaxies, particularly since there are two smaller orange objects to the right of one of them. But there are other overly bright stellar-looking orange objects in the picture that don't look much like background galaxies, and there are, in my opinion, too few normal-looking red giants among the blue stars. Or maybe the confusion arises from a lack of color saturation, so that the red stars don't stand out too clearly from the blue ones. Is it just me or is this one of the least prominent barred galaxy pictures I've ever seen?